In India, parents want their kids to have best of the education. There are plenty of Private schools, which offer high-class education, but in this race, we have left behind our roots of education. The very same thing hit a Dentist named Abraham Thomas in South India where he built a new learning center for children adopted a govt school in a village to give it a new look. Abraham wanted to have a place for the village students to come out in open and speak confidently in public. He wanted the same joining with roots Indians to belong to, The Mother Earth. The inspiration came from his grandfather who practiced medicine but never charged a penny from his patients. Abraham decided to create a school, which will allow the village students to sing, dance and learn all in traditional ways. After Abraham decided to have such place, he collaborated with a budding architecture named Dheeraj. They wanted to have a Hut as the main place to study but with all facilities. So they collected all available local materials like Clay, Hand woven fiber ropes, Bamboo, Lime, Stones, mud etc along with a water storage facility with drums. For the roof of the hut, Abraham Thomas decided to use age-old Red sander Wooden Pillars to protect from the rains. After 8 months of wear and tear and planning, finally, the amphitheater HutK was built. 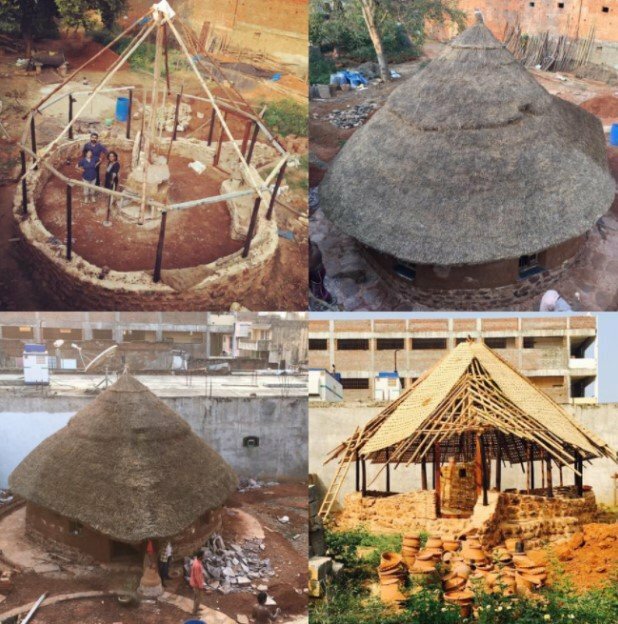 While he was working hard to have this place in his village Koduru in Andhra Pradesh, several villagers lent their hand in the work including the tribal and forest collectors. Funding on such big scale was possible because of Abraham’s friend’s support. Abraham invested close to around Rs 15 Lakhs personally in this cause. Abraham’s children never studied in private school and he understands the importance of English as well. To cover up this, he came up with a Leela Library and Learning Center. The library was made revamping the old post office of the village. The art and language-learning center strives students to learn and work on the real life opportunities. The learning would be made from grass root level, thus clearing their concepts. Apart from building a HutK place for learning, Abraham Thomas adopted a Govt school in the village named Bayana Palli M.P.P School. He always felt Govt School had a lot of potential but lacked infrastructure facilities and financial backup. After his adoption of the school, he started hygienic water supply and to save cost on electricity, implemented the Solar Power. In Fact, to eradicate the defecation problem, they built up two toilets, that too western, One for boys and One for Girls. A different toilet for all the teachers was also made. With a big compound, Gate walls etc the school has now all facilities, which a school must have. Abraham though being a Dentist understood that Education is what would progress India. It is the need of an hour and would make the lives of coming generation easier. We run behind gaining solace but in that run, we leave everything behind even what we have. With his firm belief, he transformed an ordinary govt school into a model school. This increased the number of students as well as they now have all basic facilities required in a school. The dedication and commitment to the society by Abraham Thomas is commendable and highly inspirational.